The Wizard is "A new distortion pedal, inspired by Tony Iommi's guitar sound on the early Black Sabbath albums. 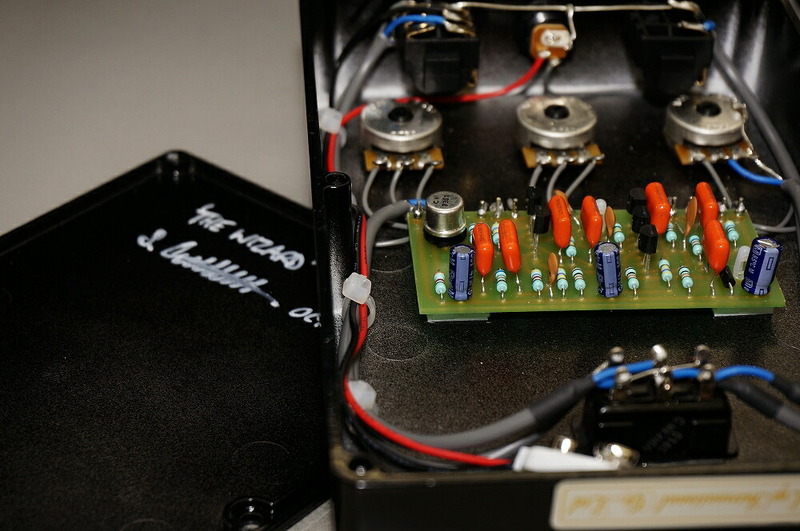 It is well known that he used a modified Rangemaster to drive his amps, so the same principle was used for The Wizard. 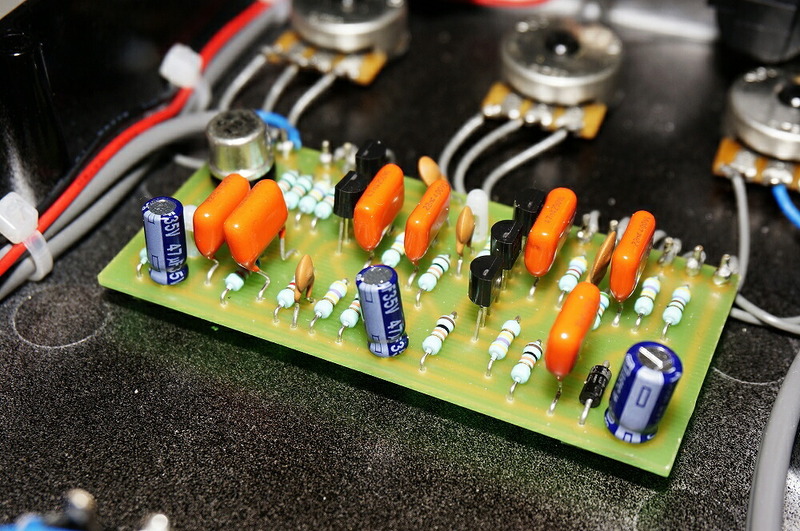 The first gain stage is essentially a Rangemaster, using a germanium transistor, but tweaked for a full range boost. That drives a distortion circuit which has been designed to give something of the tone and feel of a Laney Supergroup amp. Obviously, there is no substitute for a full stack at volume, but The Wizard has a similar distortion character and responds well to picking dynamics". The boost stage is pretty simple, but the drive section is a bit hard to decode... Could be a tube-to-JFET conversion from a Supergroup amp? Stuart should have used a larger enclosure so there would be enough space for an indicator LED. Cub wrote: Stuart should have used a larger enclosure so there would be enough space for an indicator LED. Just guessing here, but the five black trannies for the distortion section could be two muamp stages and a buffer on the output like some other "amp emulators" by catalinbread etc - I'm only going off the physical arrangment of first two transistors, and the fact the upper transistor in the first two muamp pairs appears to have the drain directly connected to +9v. I've just been messing with the C'bread CB30 vox box, so it's on my mind. I love big boxes with no LED's. I'm a bassist but I want to try this out. you manage to get your weener in through a quarter inch jackhole!? And tell us, is the input or output jack better. I's say the input since it's a stereo jack and provides more friction. he prefers the dc jack. Max, do you wear ESD protection? phibes wrote: Max, do you wear ESD protection? Do they do anti ESD bags for macrodix? Common guys, we need this traced! Anybody got better shots? I found only this one. This is a cool sounding pedal from the videos. I was looking at the photos in Photoshop and trying to clean them up and blow them up. Here is what I have found so far. There is a CV7351 NPN Ge for the Rangemaster portion of the circuit. Some of the resistor values I can make out are consistent with a NPN Rangemaster. I wonder if the 5 JFETs are like a Brown Sound or a Marshall 18watt. Looking for more photos of it now. Hope this can be traced at some point. Anyone tried just emailing Stu? I know he was really straight up with me about the circuits in the few pedals I've bought from him, and he's a really friendly guy. 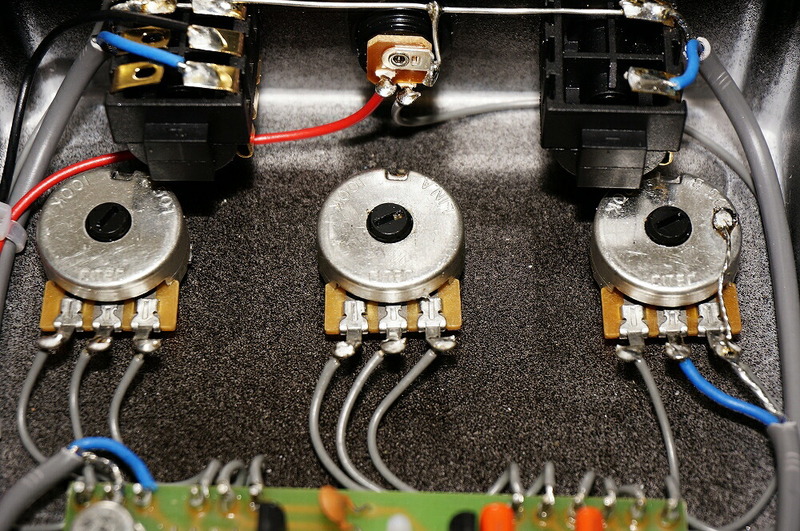 From what I can see, one pair of J201s looks to be set up as a common-source stage with a DC couple source follower, so I'd guess that it's a Rangemaster-ish thing into a JFET version of the Supergroup preamp (probably just the treble channel, or a mash up of the treble/bass channels since it's only got one gain control) with a buffered output and a passive high cut tacked in there somewhere, likely right before the master based on the location on the board. 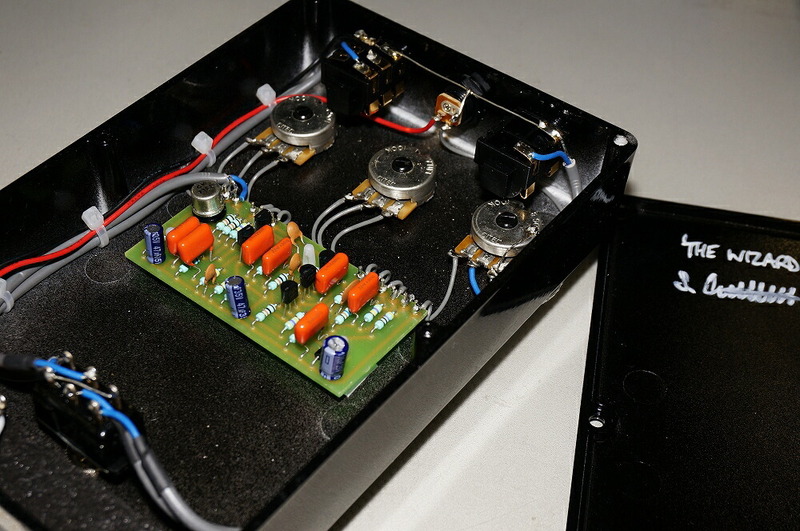 I found an album on Photobocket with all sort of snapshots of this pedal, including the bottom of the PCB. It's slightly newer and different from the ones that were posted in this thread so far. Too late to edit my previous post, but I had a go at it myself. It's my first attempt, so it's far from perfect. (please try and don't laugh too hard ) The things I'm not certain about are in red. There's a resistor between the two big orange drops that doesn't appear to be connected on one end. Also, there's a trace going from the cap on its right to... ? I can't see, but I suspect the electrolytic cap. The two images I used as a source are also attached for an unobstructed view. Perhaps the more experienced members can tell me where I went wrong or even have a go at it themselves. The second photo down will be perfect to copy using Sprint. others will probably work. Just need the cap values.